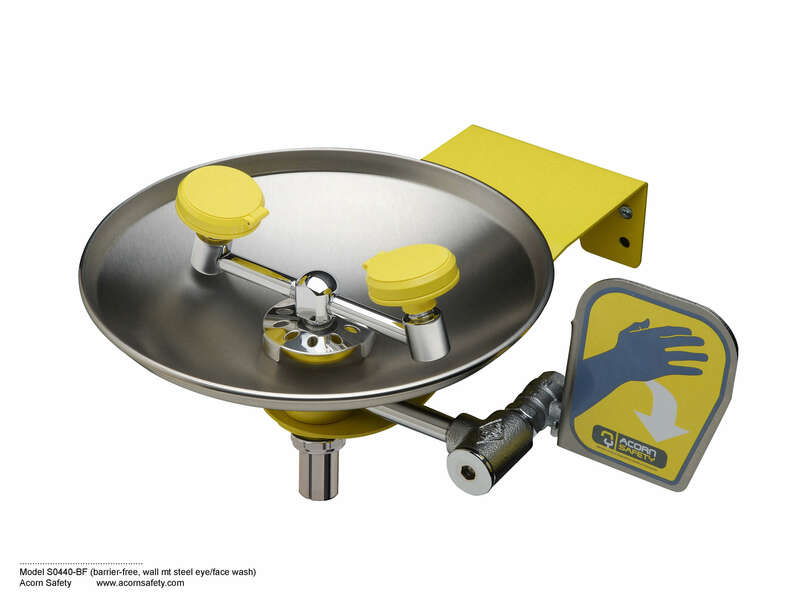 The stainless steel "clam-shell" cover rises automatically when the push handle is activated. Conversely, the cover closes when the handle is returned to the off position. The assembly may be ordered as an add-on. Model S0000-FLW2 is a 1/2" NPTI DPDT double pole, double throw flow switch which allow for remote monitoring (by others) and audio/visual alarms (by others). Switch is installed in the water supply line prior to the emergency equipment and is activated once it senses the movement of water in the supply line. As an option available for eye-face washes (or eye washes), the 1/2 inch Freeze Protection Valve will initiate flow when the thermostatic actuator senses a temperature of 35°F (1.7°C). It is typically piped to a drain and thereby purges the cold water and brings fresh water to the valve/fixture to prevent freezing conditions. The valve will remain open until it senses a water temperature of 40°F (4.4°C) or more at which point it will automatically close (resetting itself). MS1 provides a Magnetic Actuated Proximity (MAP) Switch for either an eye-face wash or emergency shower. The application of this switch is can be provided to work with the optional alarms. PT1 is available as an option. Wall mounted eye/face washes are only supplied with 1-1/4" waste outlet. The PT1 provides a 1-1/4" O.D. P-trap kit making the waste connection into the wall. As an option available for eye-face washes (or eye washes), the 1/2 inch Scald Protection Valve will initiate flow when the thermostatic actuator senses a temperature of 98°F (36.7°C). It is typically piped to a drain and thereby purges the unsafe water and brings fresh/safe water to the valve/fixture. The valve will remain open (fully open at 105°F (40.6°C)) until it senses a safe temperature of 95°F or less at which point it will automatically close (resetting itself).